Script 3 Lady Cluck: Oh, Marian, don't look around, but I do believe we're surrounded. Oh, mercy! Skippy: He snitched on us. Maid Marian: It's all right, children. Don't be afraid. Please come here. Toby: Do you think it's safe? Tagalong: That's Maid Marian. Sis: Mama said she's awful nice. Come on! Tagalong: Hey, you guys, not so fast. Wait for me. Sis: I told Skippy he was shooting too high. Maid Marian: I'm so very glad he did. Now I get to meet all of you. Tagalong: Gee, you're very beautiful. Sis: Are you gonna marry Robin Hood? Tagalong: Mama said you and Robin Hood are sweethearts. Maid Marian: Well, um... You see, that was several years ago before I left for London. Toby: Did he ever kiss you? Maid Marian: Well, uh, no. But he carved our initials on this tree. I remember it so well. Skippy: You gonna have any kids? Tagalong: My mom gots a lot of kids. Maid Marian: Oh, he's probably forgotten all about me. Skippy: Oh, not Robin Hood. I bet he'll storm the castle gates, fight the guards, rescue ya and drag you off to Sherwood Forest. Lady Cluck: Now just a moment there, young man. You've forgotten Prince John. Skippy: That old Prince John don't scare me none. Toby: I'm scared of Prince John. He's cranky. Lady Cluck: Ah! I, Prince John, challenge you to a duel. Hey, hey! Take that! And that! And this! Skippy: Death to tyrants! Sis: Slice him to pieces! Maid Marian: Oh, save me, my hero. Save me. Lady Cluck: Oh! Ouch! That's not fair. Mommy! Sis: That's Prince John, all right. Skippy: Yahoo! Now I got ya! Lady Cluck: Oh, mercy! Mercy! Oh! Oh, he got me. I'm dying. Skippy: Did I hurt you? Huh? Lady Cluck: No. This is the part where you drag your lady fair off to Sherwood Forest. Skippy: Come on, lady fair! Let's go! Maid Marian: Oh, Robin, you're so brave and impetuous. Oh. So this is Sherwood Forest. Skippy: Yeah, I guess so. Well, now what are we gonna do? Maid Marian: Well, usually the hero gives his fair lady a kiss. Skippy: A kiss? Oh, that's sissy stuff. Maid Marian: Well, if you won't, then I will. Sis: They're kissing! Alan-a-Dale - a rooster "I'm a minstrel"
Robin Hood - a fox "Just you watch this performance, partner"
Little John - a bear "Hey, old Rob's not a bad actor"
Friar Tuck - a badger "Surprise! Long live Robin Hood!" Maid Marian - a vixen "You could've chosen a more romantic setting"
Lady Cluck - a chicken "Oh, I've never been so happy"
King Richard - a lion "Oh, not bad"
Prince John - a lion "Mother always did like Richard best"
Sir Hiss - a snake "Hypnotism could rid you of your psychosis so easily"
Sheriff of Nottingham - a wolf "There's somethin' funny goin' on around here"
Otto the Blacksmith - a dog "God bless Robin Hood"
Father Sexton - a mouse "Oh, we were just saving it for a rainy day"
Mother Church - a mouse "It's not much, but please take it for the poor"
Trigger - a vulture "I still got a feelin'"
Nutsy - a vulture "One o'clock, and all's well!" 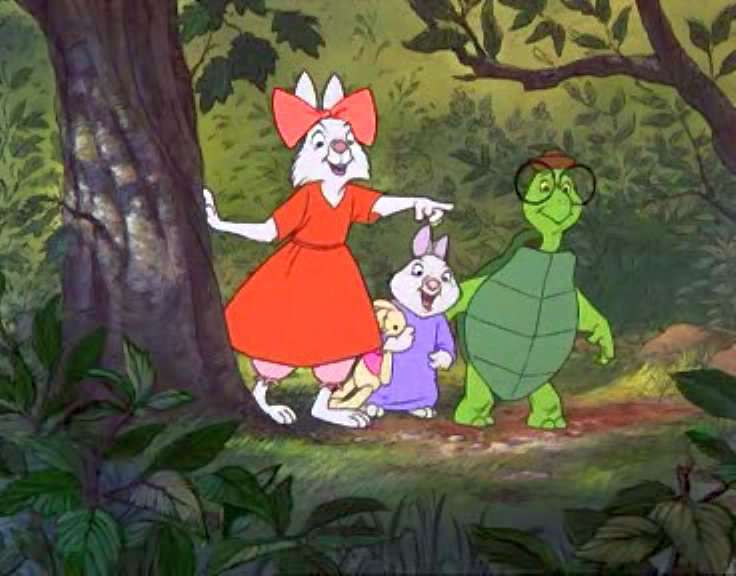 Captain of the Guards - a crocodile "Golden arrow will now begin"
Mother Rabbit - a rabbit "Mind your manners"
Skippy - a rabbit "Oh, I don't care. I gotta get my arrow"
Sis - a rabbit "Slice him to pieces!" Tagalong - a rabbit "Good-bye, Mr. Robin Hood! Come again on my birthday!" Toby - a turtle "Did he ever kiss you?" Lady Cluck: Ah, me. Young love. Oh, it's a grand thing. 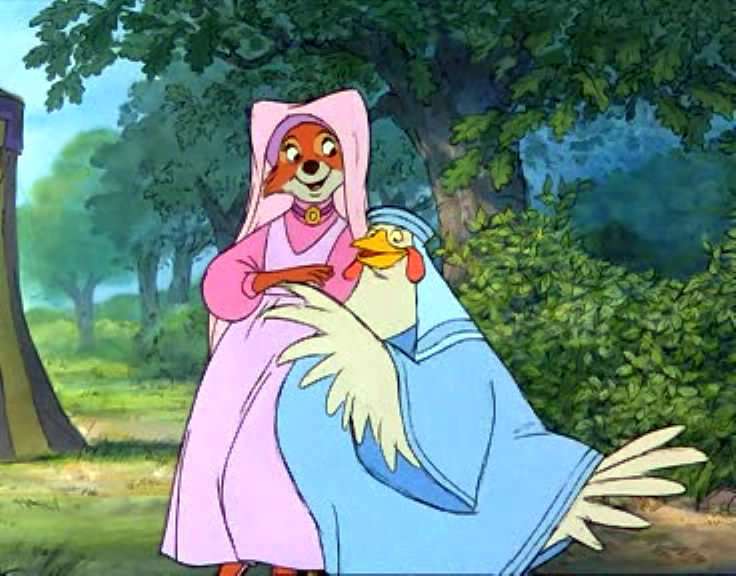 Maid Marian: Oh, Clucky, surely he must know how much I still love him. Lady Cluck: But, of course, my dear. Believe me, someday soon, your uncle, King Richard, will have an outlaw for an in-law. Maid Marian: Oh, Clucky. But when? When? Lady Cluck: Oh, patience, my dear. Patience. Remember, absence makes the heart grow fonder. Maid Marian: Or forgetful. Oh, I've been away so long. What if he's forgotten all about me? Little John: Hey, lover boy. How's that grub comin'? Man, I'm starved. Rob? Robin? Robert? Hey! Robin Hood: Hmm? What? What do you say? Little John: Aw, forget it. Your mind's not on food. You're thinkin' about somebody with long eyelashes, and you're smellin' that sweet perfume. Robin Hood: Hey, whoa! It's boiling over! Little John: You're burnin' the chow! Robin Hood: Sorry, Johnny. Guess I was thinking about Maid Marian again. I can't help it. I love her, Johnny. Little John: Look, why don't you stop moonin' and mopin' around? Just... just marry the girl. Robin Hood: Marry her? You don't just walk up to a girl, hand her a bouquet and say, "Hey, remember me? We were kids together. Will you marry me?" No. It just isn't done that way. Little John: Aw, come on, Robbie. Climb the castle walls. Sweep her off her feet. Carry her off in style. Robin Hood: It's no use, Johnny. I've thought it all out, and it just wouldn't work. Besides, what have I got to offer her? Little John: Well, for one thing, you can't cook. Robin Hood: I'm serious, Johnny. She's a highborn lady of quality. Little John: So she's got class? So what? Robin Hood: I'm an outlaw, that's what. That's no life for a lovely lady. Always on the run. What kind of a future is that? Friar Tuck: Oh, for heaven's sake, son. You're no outlaw. Why, someday you'll be called a great hero. Robin Hood: A hero? Do you hear that, Johnny? We've just been pardoned. Little John: That's a gas. We ain't even been arrested yet. Friar Tuck: All right. Laugh, you two rogues. But there's gonna be a big to-do in Nottingham. Well-done, ain't it? Old Prince John's havin' a championship archery tournament tomorrow. Little John: Archery tournament? Old Rob could win that standin' on his head, huh, Rob? 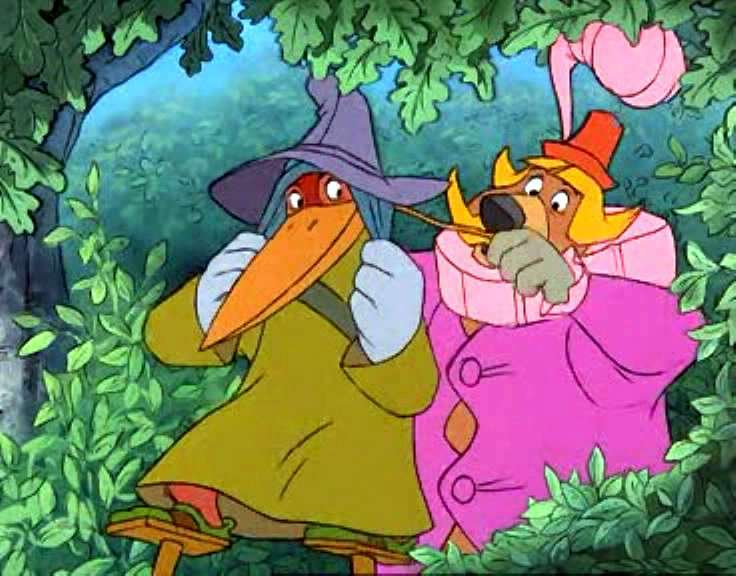 Robin Hood: Thank you, Little John, but I'm sure we're not invited. Friar Tuck: No, but there's somebody who'll be very disappointed if you don't come. Little John: Yeah, old bushel britches, the honorable sheriff of Nottingham. Friar Tuck: No, Maid Marian. 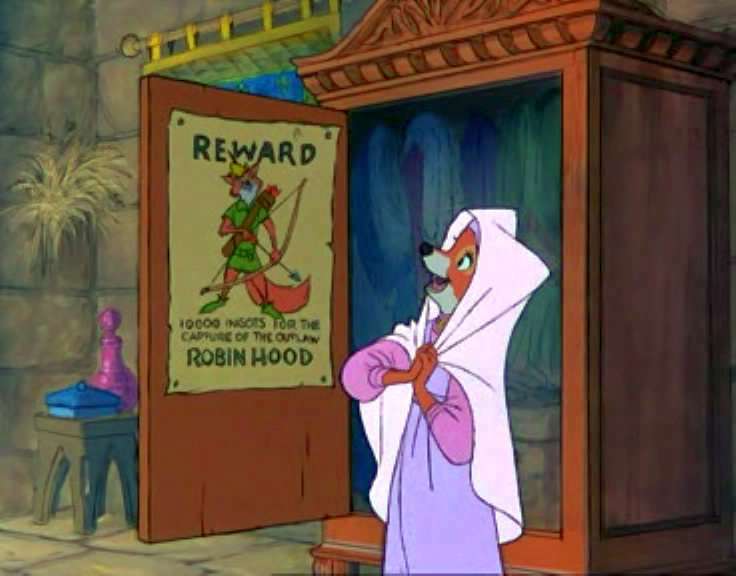 Robin Hood: Maid Marian? Friar Tuck: Yeah. She's gonna give a kiss to the winner. Robin Hood: A kiss to the winner! Oo-de-lally! Come on, Johnny! What are we waiting for? Little John: Wait a minute, Rob. Hold it. That place will be crawlin' with soldiers. Robin Hood: Aha! But, remember. Faint hearts never won fair lady. Fear not, my friends. This will be my greatest performance. Prince John: Hiss, this is a red-letter day. A coup d'état, to coin a Norman phrase. Sir Hiss: Oh, yes, indeed, sire. Your plan to capture Robin Hood in public is sheer genius. Prince John: Hiss, no one sits higher than the king. Must I remind you, Hiss? Sir Hiss: Oh, oh, forgive me, sire. I didn't mean to... Prince John: My trap is baited and set and then revenge! Ah, revenge! Sir Hiss: Shh! Not so loud, sire. Remember, only you and I know, and your secret is my secret. Prince John: Stop! Stop hissing in my ear. Secret? What secret? Sir Hiss: Why, the capture of Robin Hood, sire. Prince John: That insolent blackguard. Ooh! I'll show him who wears the crown! Sir Hiss: I share your loathing, sire. That scurrilous scoundrel who fooled you with that silly disguise, who dared to rob you and made you look utterly ridiculous... Prince John: Enough! Hiss, you deliberately dodged. Sir Hiss: But... Sire, please. Prince John: Stop sniveling and hold still. Sir Hiss: Thank you, sire. Maid Marian: Oh, Clucky, I'm so excited. But how will I recognize him? Lady Cluck: Oh, he'll let you know somehow. That young rogue of yours is full of surprises, my dear. Robin Hood: There she is, Little John. Isn't she beautiful? Little John: Cool it, lover boy. Your heart's runnin' away with your head. Robin Hood: Oh, stop worrying.